The filing of the Mueller report and Attorney General William Barr’s subsequent letter to Congress set off a firestorm on both sides of the aisle over the last week. 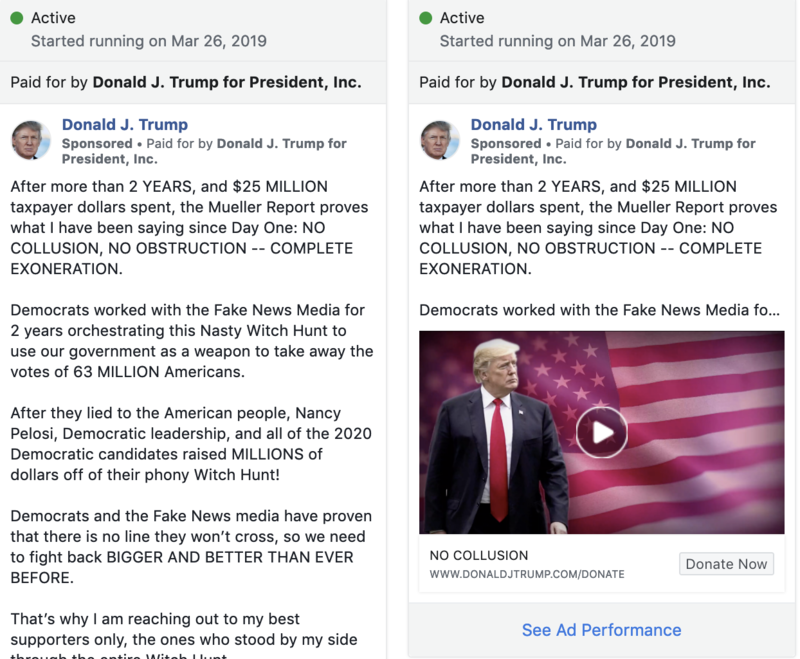 But how did those developments impact the 2020 presidential candidates’ digital ad strategies? And did Barr’s letter achieve what he (and Trump) needed? We dig into it in this week’s FWIW. And for all you Game of Thrones fans out there – make sure to scroll to the end and join us in the real battle for the throne, coming next month. 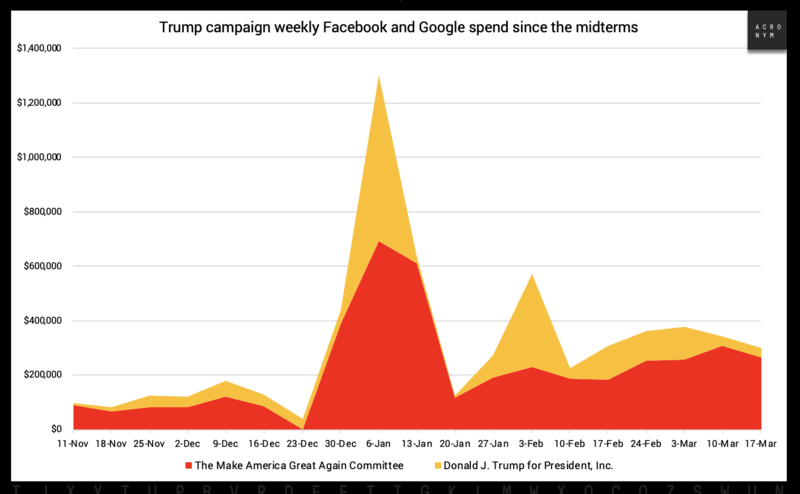 Earlier this week Donald Trump’s campaign manager, Brad Parscale, was quoted by Forbes saying that the Trump campaign was spending $2 million a month to capture the email addresses and phone numbers of “every single person who could vote for Donald Trump before the election.” Here’s a breakdown of how much of that $2 million has been put towards digital advertising alone on Facebook and Google in the months since the midterms. 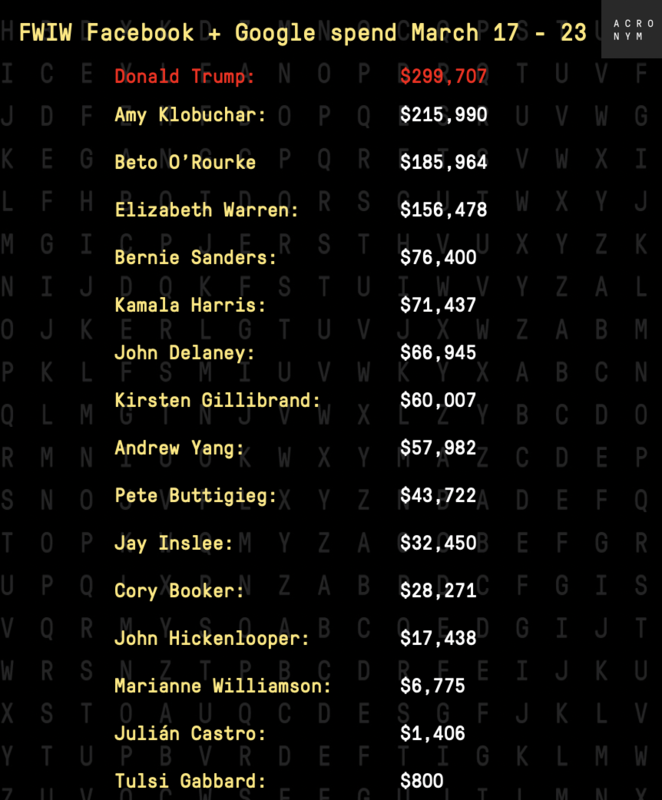 And of the $1 billion that Parscale said the Trump campaign would spend on the 2020 election, over $6 million has already been spent on digital advertising in just four and a half months since the 2018 elections. 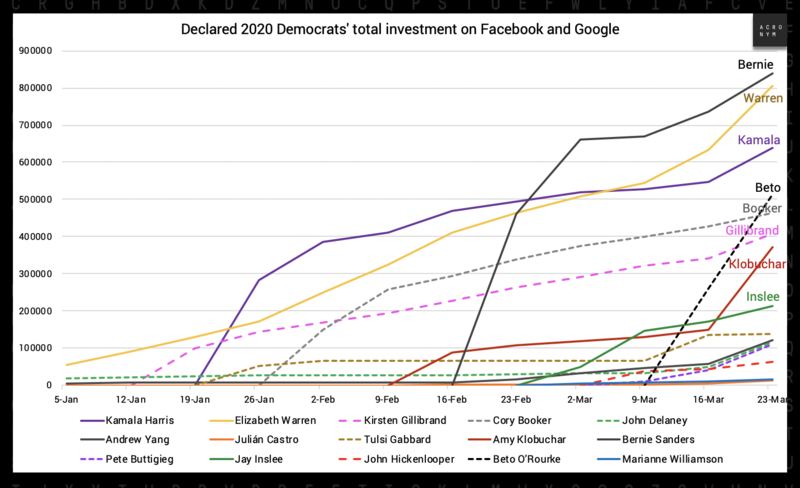 Here is how Trump’s weekly investment compares to the rest of the declared 2020 field last week, and how the total digital investment from each 2020 Democrat has grown overtime. 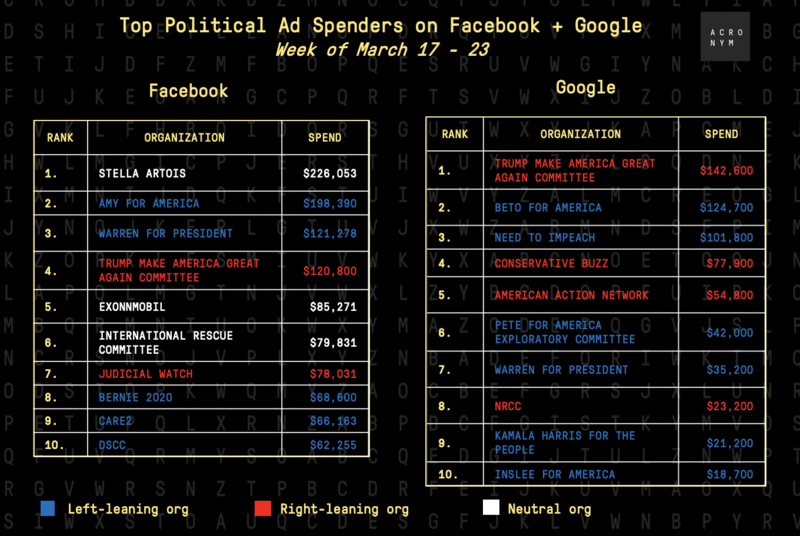 Of the top Facebook and Google spenders from March 17 – 23, the DSCC made the list for the first time this cycle, as they ran dozens of ads last week to build their own lists featuring Mitch McConnell and Donald Trump in their content. 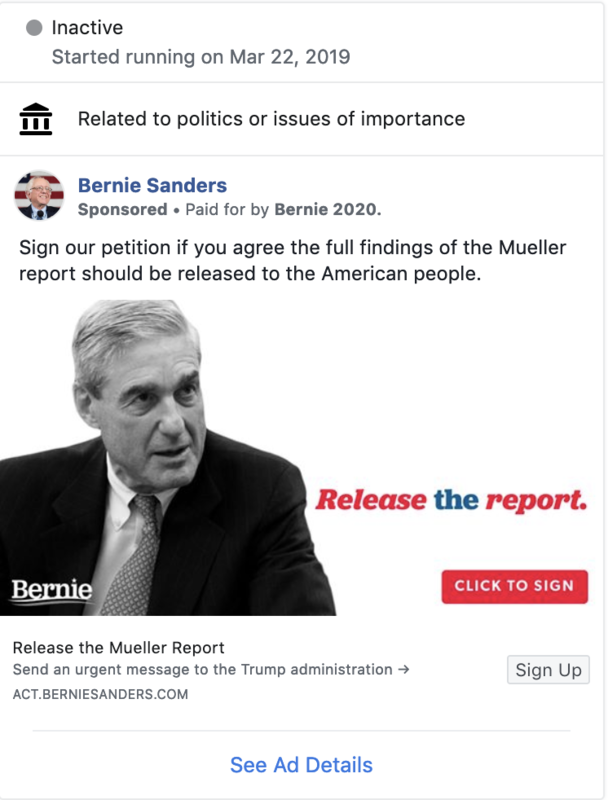 And at least half a dozen presidential candidates on the Democratic side immediately started running petition ads on Facebook following Friday’s news, including Cory Booker, Bernie Sanders, Kamala Harris, Elizabeth Warren, Julián Castro and Amy Klobuchar. This is unsurprising, given the fact that the Mueller investigation is a red-meat issue for base Democrats and can be more effective in engaging progressive voters than other topics. Read more about that in a previous issue of FWIW here. What is surprising, however, is what happened after Barr sent his letter to Congress. 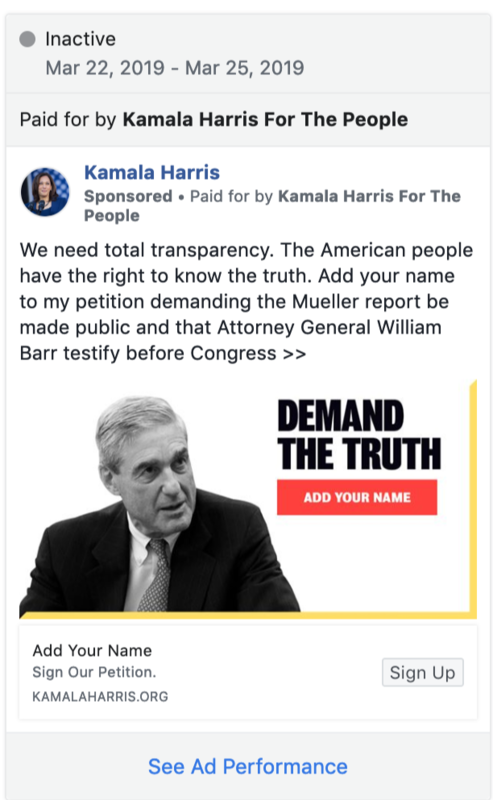 Immediately after Attorney General William Barr sent a letter to Congress on March 24th outlining how Mueller’s team had not found sufficient evidence for collusion and that they had not come to a conclusion on the obstruction of justice issue, the digital ad landscape changed. 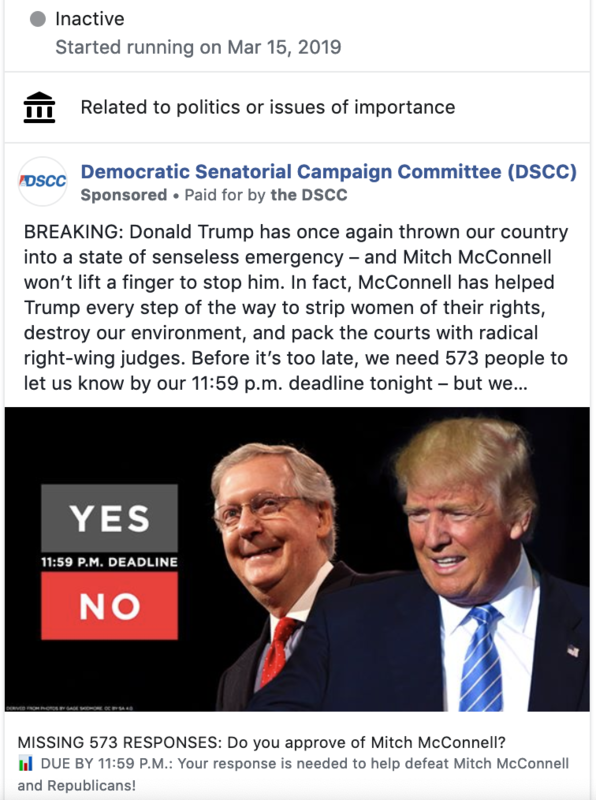 In looking through the Facebook ad archive, we found that within one day of Barr’s letter being released, nearly every single Democratic presidential campaign stopped running ads advocating for the release of the report. 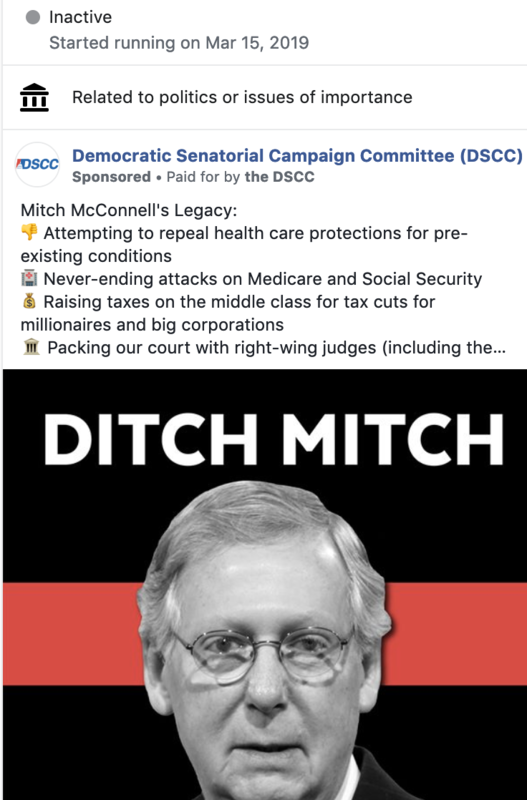 As of today, only one Democratic candidate is currently running Facebook ads mentioning Mueller and/or William Barr, and that’s Kirsten Gillibrand. 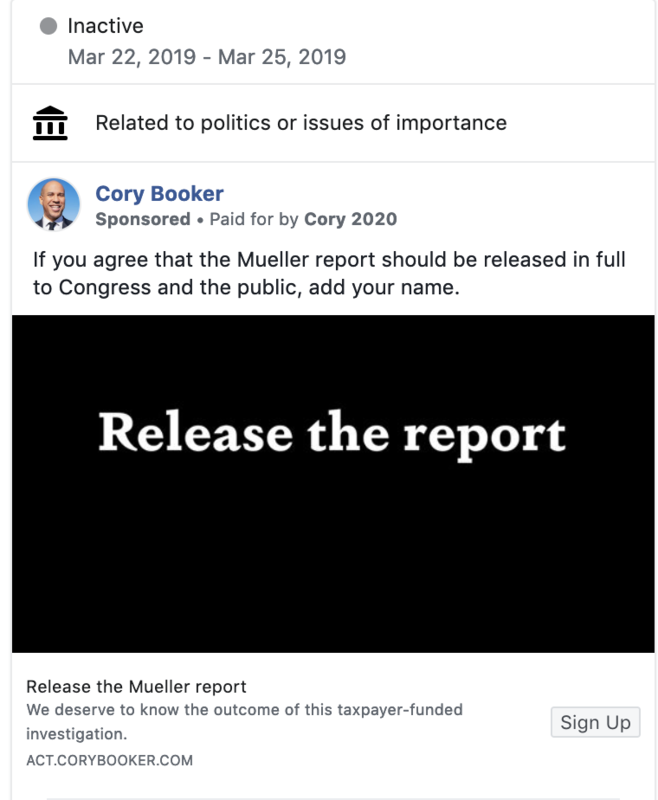 Every other Democratic candidate we found who had been running ads prior to Barr’s letter is now silent when it comes to digital paid media on the Mueller issue. 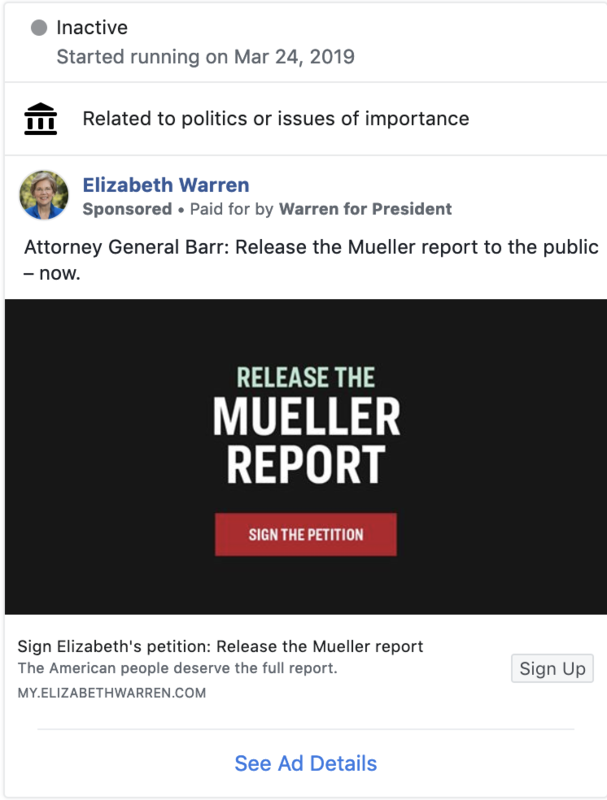 This begs the question – was Barr’s effort somewhat successful in tamping down the Mueller report narrative that was being driven on the left? 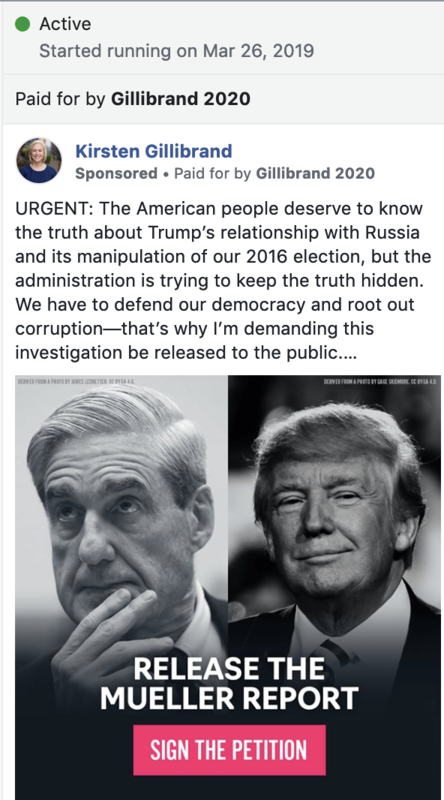 And now that the investigation is over – even with the ongoing controversy of whether the full Mueller report will ever be released – is it no longer an issue that motivates base Democrats? Shoot us a note with your hot take™️ . We’ll be keeping our eye on the developments of this issue in the media over the coming weeks and months – and how it’s translating (or not) to the paid digital landscape. If you (like us) are eagerly awaiting the Game of Thrones premiere, and if you (like us) can see infinite metaphors between the battles in Westeros and the 2020 presidential election, then sign up for ACRONYM’s Game of Elections. In each week of Game of Elections, which will start mid-April, we’ll roll out new content, trivia and prizes around the 2020 election using Game of Thrones themes and storylines. And each week you can see which candidate is winning the game (right now, Mayor Pete is in the lead). That’s all for this week. To sign up for weekly updates, visit www.anotheracronym.org/fwiw, and make sure to follow us on Twitter and email us with ideas of what you’d like us to dive into next.